MarsDrop is an initiative to develop an inexpensive space probe that will land on Mars using a parawing. The parawing will allow the probe to fly significant distances through the Martian atmosphere under controlled guidance. The only way this can be tested on Earth is to drop the probe and parawing from a high-altitude balloon in the stratosphere where the conditions mimic those found on Mars. Orbital Transports is collaborating with Far Horizons and The Aerospace Corporation to develop the guided descent components. We conducted the first test of the parawing and guided descent components today. 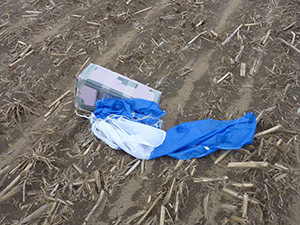 The parawing unfortunately failed to deploy as expected and the payload container plumeted from a height of 35,000′ into a cornfield in Indiana. Surprisingly the payload container maintained structural integrity, surviving the crash. There were no casualties and no loss of equipment.